Ever since I was a child, I have had this attraction towards water, water sports and swimming in particular. I learned to swim from a very young age and practicing this amazing sport always gave me a feeling of freedom and self-confidence. Whenever I see a patch of water, I have this urge to dive in, so I guess it’s my second nature. When I first started swimming, I didn’t expect to like it so much and become addicted to it, but considering swimming has become such an important part of my life, I want to share with you what I love most about it. 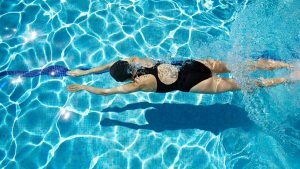 First and foremost, swimming is great for anyone due to its multiple physical and mental health benefits, as it is a great way to keep fit and alleviate stress. Although during swimming you have to use almost all your muscles, it is a low-impact workout which helps you maintain a healthy weight, healthy heart and lungs, builds endurance, tones muscles and builds strength. Also, it lowers the risk of diseases such as heart disease, stroke and type 2 diabetes. Secondly, swimming is an accessible and cheap activity and can be practiced even by people with physical disabilities or those who are unable to undertake more demanding activities such as running. The water provides support and reduces impact, so it’s also good for therapy and rehabilitation in various cases of cardiovascular injuries and muscle injuries. As well as being a healthy activity that you can continue for a lifetime, swimming is also fun and a great recreational activity for people of all ages. I discovered that the time I spend in the pool is the best time for meditation and a source of renewal for me. This is because when I get in the water, I can forget about everyone and everything else around me and just be with myself. It’s the time of day when I sort through my thoughts and make peace with every aspect of my life. Additionally, swimming has always given me a sense of power, freedom and control. When swimming, you are both the master of ceremonies and the performer. Especially when you do it for fun and recreation, you make all the decisions and control the pace, intensity, and what you get out of every swimming session. There is no pressure, there is no competition, except the one with yourself and your own boundaries. And last but not least, swimming makes wonders for your skin and body and makes you look younger. It has been proven to turn back the clock, or at least keep it still, through an increased metabolic rate. All in all, though it consumes my energy, swimming also gives me energy, boosts my mood, provides fun and relaxation, and a sense of pleasure I was able to find in few other activities, and that’s what makes me spend a huge amount of time in the water. And if I do it with some friends, it becomes even more fun.